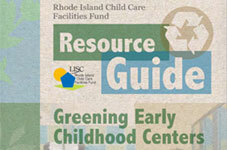 Greening Early Childhood Centers is the latest in a series of educational resource guides developed by LISC’s Community Investment Collaborative for Kids (CICK), detailing environmentally-sound building design and facility management practices tailored specifically to the needs of this sector.Created in collaboration with LISC’s Green Development Center, this guide focuses on high-impact green design and capital investment strategies that can be implemented over the long term, as well as low-cost/no-cost ideas for physical improvements, environmental education and facilities operations that early childhood centers can undertake right away. While individuals and organizations across all sectors are recognizing the need to conserve natural resources and reduce pollution, green design and development strategies are especially compelling for early childhood centers. Our youngest children are highly vulnerable to environmental toxins and chemicals. They would benefit greatly from healthier indoor and outdoor surroundings in which to learn and play. For many financially-strapped early childhood centers, lowering energy costs for heating, air conditioning and lighting will be a welcome relief. Additionally, preschool years are an ideal time to introduce our next generation to the wisdom of green thinking. Many thanks to Senator Jack Reed and the Home Depot Foundation for sponsoring this publication.